The aim of the EuWireless project is to study the technical, legal and economic solutions that encourage mobile network providers to share their infrastructures with universities, research centres and small businesses. This project comes under the framework of new infrastructure designs resulting from European research. The consortium comprises the University of Málaga (coordinator), VTT (Finland), DEKRA Testing and Certification (Spain), NORDUnet (Denmark), IS-wireless (Poland) and Time.lex (Belgium). On a technical level, the aim of the project is to design viable solutions for sharing parts of the mobile network with the research community. This will be acheived by first examining current mechanisms and those under development, to share the range, the access nodes, the transport network and the core network. For instance, although the MOCN and DECOR solutions will be considered, the project will also advance in sharing solutions, as defined in 5G networks (slicing mechanisms for services with SDN, NFV, 5Gcore, etc). From a legal standpoint, within the project, a study on all European countries will be completed to identify possible regulatory barriers so as to propose workable solutions for each country. On an economic level the project will identify those business models which will ensure that commercial operators directly benefit from the controlled transfer of their resources for research purposes. 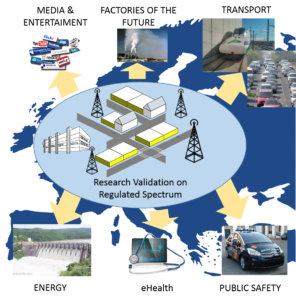 This set of solutions will lead to the design of a virtual operator for European-wide research to act as the broker between the commercial operators and the research community. The creation of this virtual operator will necessarily imply the development of software to link the operators with the deployed points of presence belonging to EuWireless, in those areas of Europe where the service will be offered. A responsible entity will also have to be created to manage all legal and economic aspects.